A PERPETUAL MOTION ENGINE OR AN ECONOMY WITHOUT A BOOM AND BUST CYCLE IS A FOOLS GAME! I’m just a simple uneducated self-made writer, but blessed with almost supernatural wisdom. However, with this all out epic battle of respect for constitutional law versus this liberal emotionalism disrespect for the law, to me the whole thing is a fool’s game that solves nothing. No matter who wins it solves nothing because the core problem with the USA is culture, culture, and more culture, period. The federal government is blocking natural forces that protects and safeguards a society’s culture, which means government can never solve the problem because government is the problem. The problem will solve itself and go away if government will just get the hell out of the way, an example of government blocking progress is Venezuela. The 1938 federal government minimum wage law is what set in motion the destruction of the USA culture, and nothing can stop the USA final destruction doom until that law is repealed. Repealing that 1938 law is the only thing that can save and restore USA culture. I don’t care how much the learned economist and eggheads fine tune the economy it is still a fools game and will collapse in the end anyway. The reasonable and sensible thing the USA should be doing is rebuilding a strong nuclear and extending family system and acquiring adequate bartering capacity with small farmers and home gardener to survive and get through an economic collapse. But, it is a circle back to square one the same culture destruction cause; you can’t restore a strong nuclear and extended family system or hardly anything else with a federal minimum wage law in place. I don’t know when but I can assure you an economic collapse is coming sooner or later. This kind of advice and wisdom a liberal will never understand, that is why I could never trust the survival Of this great nation (USA) in the hands of a shallow minded liberal. In my view Trump is a Godsend and the last obstacle standing in the way of liberals completely taking over the USA. Afterward, followed by mass civil disruption all over the place that would brings on authoritarian rule just to maintain peace and order. Thereby giving liberals a reason and means to take our guns, our individual freedom, and tax-free means to worship. I pray that I'm wrong on this, but these modern day liberals are living in a fairy tale fantasy world way beyond any true reality. And these shallow minded liberal TV networks are leading the pack poisoning good minds 24-7 with this polluted culture rot and moral decay slop. FRED THE TENDER HEARTED WRITER’S LOG: 29 AUGUST 2018, 0001 HOURS. USA CULTURE IS IN A DESTRUCTIVE FREE FALL, CAN IT BE SAVED AND RESTORED? Sure, I come down hard on liberals and liberalism, but placing blame on any one demographic group is missing the whole point on the long-term survival of the USA. This nation is full of good and decent liberals, conservatives, Christians, and any demographic group one can think of. I keep trying to drum it in but no one wants to believe me on how to save USA culture. It is simple, the USA and western civilization is losing their culture, and when any nation loses its culture that threatens its future survival. Any one in the USA with real wisdom should know that the country is on a direct course leading to some kind of authoritarian rule to prevent total civil disorder fairly soon. I assure you that is a given, it is going to happen without a doubt fairly soon. That is it, those are the two choices. However, there is only one other exception lifeline that I have been advocating for well over twenty years. But, I’m afraid it is a lifeline the USA will forever refuse to grab, because if history is any guide, power will always go down with the ship. There has never been a case of a nation changing its course from the top down even knowing it is headed toward doom. The lifeline I’m talking about is to simply repeal the Arch-evil 1938 socialist federal wage law, which will restore back the USA economy’s purging power. Then that purging power would enforce the necessary societal discipline that would rebuild the USA culture along with our nuclear and extended family foundation. Otherwise, there is no hope for a lasting free USA unless its culture can be saved and restored. A word to the wise is sufficient. If a nation doesn't have a strong culture, it has nothing in terms of long-term survival. Human nature never changes; today's human nature is the same as it was 6,000 years ago. In 6,000 years we know there has never been a society that survived without a strong nuclear and extended family foundation. We know that a survival need is the glue that holds every society together, and a welfare state removes that glue from the nuclear and extended family system. But, the most important thing free nations have yet to understand is: Any free nation with vast individual freedom cannot last over four or five generations with any kind of federal minimum wage law in place, period. The USA today has this vast amount of liberal's hell bent on taking down our God sent president. However, if the USA had any kind of strong societal discipline the nation wouldn't be producing this huge amount of liberals in the first place. With this proportion of liberals in our society it only means the USA really has a P.... society, and our freedom days are numbered. Personally, I think all of this "Gotcha stuff" representing U.S. law is being abused directly in our face and is breeding disrespect for the law. And makes one wonder just how low will this mockery of equal justice under the law go. FRED THE TENDER HEARTED WRITER’S LOG: 23 AUGUST 2018, 0207 HOURS. It amazes me that all of these anti-Trump liberal TV networks treat the president as just another stumbling block in their way to full socialism. What they fail to admit is the president is the highest single constitutional official in our entire nation, and of the three branches of government he is the head of the entire executive branch. And he is the commander over all of the military. Sure, no one is above the law, but that is the point even the president deserve equal justice under the law, which I believe has been almost totally denied him in starting and continuing this witch hunt to take down a legally elected president. Personally, what I think was really at stake in the 2016 presidential election was the survival of individual freedom in the USA. We came within inches of losing individual freedom in the USA forever. And we are now seeing proof of the raw liberal power that was in place to pounce. That raw liberal power is now flexing its muscles showing its disappointment and displeasure by attempting to take down a legal elected president of the USA. Sure, through Trump individual freedom escaped this time, but unless the 1938 fair labor wage law is repealed it is impossible to stave off the liberals much longer, the future is on their side and they will soon get their victory. It saddens me, but the USA no longer has the wisdom or the will to do what must be done to stop our shallow minded liberal friends from causing USA total destruction. USA CONSTITUTION IS BECOMING MEAN-LESS WITH A CULTURE BEING OVER RUN BY MASSES OF LIBERALS WITH HARDLY AN OUNCE OF COMMON SENSE OR SOUND JUDGMENT. Yet, non-stop TV networks are poisoning good, decent, and positive young minds each day to no end. This shallow minded, counter productive, and anti-survival culture rot and moral decay makes it impossible for the USA to survive long term, period. Culture in terms of the health and long-term survival of a nation is everything, period. 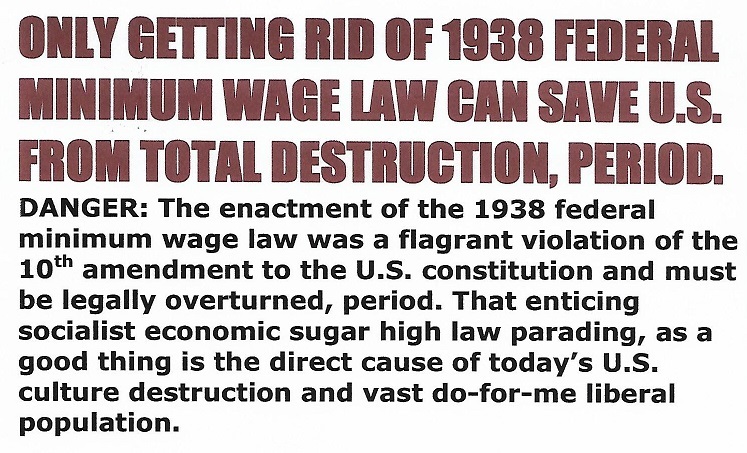 And that is the core problem with the USA; the 1938 federal wage law is what set in motion the decline and final destruction of the once strong and all-powerful USA culture. Before 1938 about the only place you could find a true bleeding heart liberal was from a rich family or from an Ivy League collage. Now they are being bred off the welfare state production line, bred out of the ghetto, bred out of the slums, bred out of the wood works, and everywhere. Never in history have the very poor ever been liberal and moral corrupt on a grand scale like today in the USA. The poor is killing the unborn in the womb more than any other demographic group. Lack of societal discipline always breeds liberalism, which always leads to total chaos. Are we there yet, not quite? Yet, who gives a damn, culture in the USA has been reduced to just another seven-letter word, how sad. The 1938 federal wage law is what allowed the production of all of these liberals running around with hardly an ounce of common sense or sound judgment. I love-um them liberals but they can’t be trusted with the survival of this great nation in this writers view. Ninety percent of the USA population doesn’t give a damn about culture. How could they, when most don’t know what the hell a strong culture really is anymore? Today any and everything goes, if it feel good do it, who gives a damn anyway. I’ll just cut this short and end by saying: Nothing can rescue what is left and restore USA culture until the 1938 federal wage law is repealed. I wonder when is anyone going to hear me on this last lifeline to save the USA as a free nation.